Organic farmers and gardeners know how important it is to keep seeds as healthy as possible. The growth of a plant is determined by the seeds and the care you provide as it grows. The process of actually growing it can be tiring but the reward is all worth it. Let’s say, you will gain more when you plant seeds than buying new ones. Seeds of high quality can be transferred from one phase to another. Plants can grow in your garden soil and climate and can adapt over the years even if you plant it in your organic garden. Seeds come in many types and conditions. Be careful to choose only the seeds from the best and healthiest plants which have good and vibrant flowers. Avoid keeping hybrid seeds as they were artificially created and can result less production. The seeds of plants that go through an open pollination or cross pollination process are ideal for seed keeping. This is a natural process which is more reliable just as long as there’s no cross pollination with other plants from the same species. The best time to harvest the seeds is during a sunny day, after the dew has dried. Just remove the fibers and pulp, rinse off the slime using mild bleach and set the seeds on paper towels to drain, ideally under the heat of the sun. There are some plants like lettuce, dill and flowers where their seeds scatter easily. Shake them using a paper bag, each day until you have enough seeds. There are also plant seeds you can handpick like organic seeds of beans, sunflower or pepper. Before preserving these seeds, make sure to dry them preferably under the sun, but the can also be dried at room temperature. The main thing is make sure the seeds are completely free from moisture. Tomatoes, unlike other plants may take more time to prepare before storing. To preserve tomato seeds, cut tomatoes in half and remove all the seeds. Place the seeds in a jar, add a few teaspoons of water and cover it. Create a hole in the cover and place the jar in a warm place. Stir it 2 to 3 times each day until it ferments. This process kills the bad seeds and diseases. The bad, non-viable seeds will float and the good, viable seeds will sink to the bottom. Remove the non-viable seeds and place the remaining mixture into a filter. Rinse with cold water and rest it on paper towels. Keep seeds in a dry area that is moisture free to prevent mold growth. Desiccant containers are ideal storage packs since they help keep moisture away from the seeds. Plastic containers, glass jars or paper cups can also be used to store the seeds as long as they are dry. 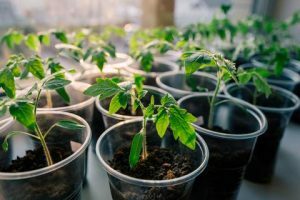 Label the containers or cups with the type of seed and the date they were initially stored to prevent any mix ups when it is time to plant them. Seeds must be kept in a cool, dry and dark place until it is time to plant them. 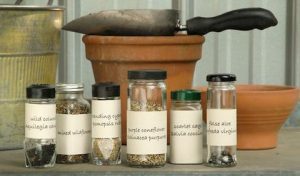 Preserving organic garden seeds during the end of a growing season will definitely save you a lot of money and effort. It will also ensure you to have a delicious harvest and allows the plants to become more adapted to your local climate. Background information for this article was provided by Rogue Hydro. What’s so Great About Heirloom Seeds?